Have you ever experienced intense cravings, especially for junk food, when you were dieting? Have your weight-loss efforts ever been sabotaged by uncontrollable hunger? Do you find that you eat when you're stressed? Has emotional eating ever derailed you from your efforts to eat healthy? If you're anything like virtually everyone else on the planet, the answer is a resounding yes. Simply put, your hunger becomes uncontrollable, you have intense cravings, you get stressed, and like any normal human being, you give in. Your body, your hunger hormones, and your environment are fighting against you. That's why I'm excited to introduce you to CraveFix 96, a brand-new, study-backed, appetite-curbing super formula that addresses the top obstacles that have been holding so many of us back from achieving weight-loss success: uncontrollable hunger, pesky cravings, and stress-induced and emotional eating. Unlike most appetite management formulas, CraveFix 96 is backed by REAL science. In a placebo-controlled study conducted at the Applied Science and Performance Institute, a group of world-class researchers, including Dr. Jacob Wilson, found that CraveFix 96 increased satiety (the "fullness factor"), improved mood, and reduced hunger and cravings. Further proof that it really works! 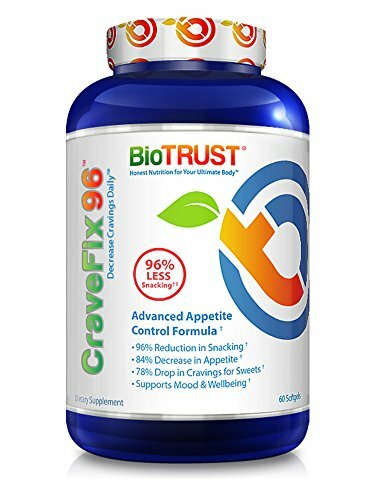 Now losing fat-and keeping it off-can be a heck of a lot easier with the science-backed CraveFix 96, the only product in the world to contain this unique combination of craving-conquering, appetite-curbing super ingredients. Plus, you're protected by BioTrust's industry-best 1-YEAR 100% Satisfaction Money Back Guarantee. So, if you're ready to join nearly 20,000 others and kick your cravings to curb, put an end to self-sabotaging snacking, and take control of your appetite, now is the time to add CraveFix 96 to your cart. It's simply the best! CRUSH PESKY CRAVINGS. How many times have your dieting efforts been derailed by junk food cravings? Probably too many to count. Take control with CraveFix 96, which is scientifically formulated to crush cravings, reduce snacking, and ease the frustration of dieting. CraveFix 96 can help raise levels of the mood-boosting "feel-good" chemical serotonin, which also increases feelings of fullness and satisfaction and combats the hunger hormone ghrelin. LOSE FAT WITHOUT BEING HUNGRY ALL THE TIME. Have your weight-loss efforts ever been sabotaged by uncontrollable hunger? If so, CraveFix 96 may be the secret weapon you've been looking for. This brand-new, appetite-curbing super formula addresses the top obstacles that have been holding so many of us back from achieving weight-loss success. BACKED BY REAL SCIENTIFIC RESEARCH. Unlike most appetite management formulas, CraveFix 96 is backed by REAL science. In a placebo-controlled study conducted at the Applied Science and Performance Institute, a group of world-class researchers, including Dr. Jacob Wilson, found that CraveFix 96 increased satiety (the "fullness factor"), improved mood, and reduced hunger and cravings. Further proof that it really works! "WILLPOWER IN A BOTTLE." Simply take one softgel 30 minutes before your two largest meals of the day-or when cravings are strongest-to experience the craving-conquering, appetite-controlling benefits of CraveFix 96 for yourself. GMP QUALITY ASSURED. Independent laboratory testing ensures potency and purity. No sugar and no artificial sweeteners, flavors, colors or preservatives added. Gluten-free, soy-free, dairy-free, and non-GMO.